The goal of a fault-tolerant environment is to ensure that if a hardware component fails, FME Server remains online. The fault tolerant architecture is comprised of redundant FME Servers spread across separate servers. A third-party load balancer is required, which directs incoming traffic to one of the redundant web components. 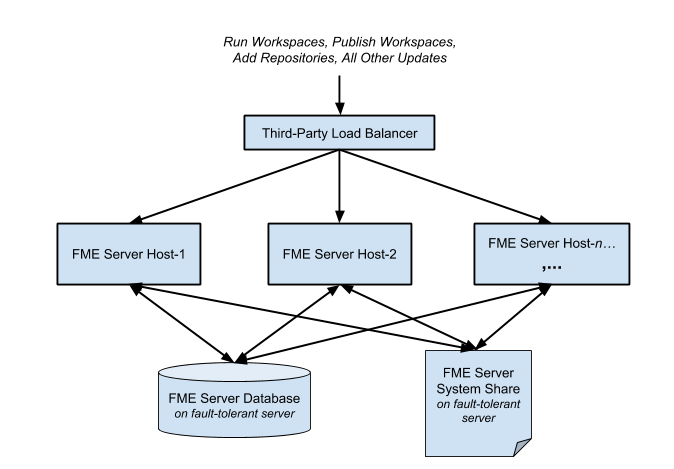 Organizations are expected to maintain the FME Server Database and FME Server System Share (a file system for hosting Repositories and Resources) on their own fault-tolerant servers. This ensures the fault-tolerant FME Server has reliable access to workspaces, repositories, resources, and other items. Note: In a fault tolerant installation of FME Server, the Notification Service UDP Publisher and SMTP Publisher are not supported. To receive e-mail notifications, consider the IMAP Publisher instead. Proceed to Installing a Scalable, Fault-Tolerant FME Server.